We hope that you enjoyed one or more of the many Burrough’s Field Trips and look forward to seeing you on one of the upcoming trips. Field trips include a diverse selection of locations from city parks, state parks, conservation areas, wildlife areas, and national wildlife refuges. During the 2017 Calendar year, the Burrough’s Field Trips saw many individuals experience new “life” birds, offered exceptional views of rare and tough to see birds, and time with other nature-loving individuals. Burroughs Field Trips collectively observed 246 species in 2017 and over 127 thousand individual birds! Of this total there were 227 species observed in Kansas, 161 species observed in Missouri, and 10 species observed in Illinois. There were 37 trips offered in 2017! These trips included 3 overnight multiple-day trips to Council Bluffs, St. Louis, and Great Bend. In addition there 8 all-day trips and 26 partial day trips. The partial day trips included 20 trips in the morning that ranged as short as an hour or last until noon, 4 trips that started in the afternoon and lasted a couple of hours, and 2 trips that started at dusk and went into the night. The 2017 trips had a total attendance of 326 people! Some individuals were counted multiple times in this tally if they attended multiple trips. The trips had 11 different volunteer trip leaders including six volunteers who led four or more trips and also a first-time trip leader! This is an amazing job and a huge thank-you to all that assist with these opportunities. We encourage you to share your experience with others. Add your photos to the trip list within eBird, share them on social media, and invite your friends to an upcoming trip. 12/10/2017 – Participants carpooled around Smithville Lake and scanning from different vantage points to find 36 species. A White-Winged Scoter was found just before last light as gulls started to roost. 12/2/2017 – Twenty-five people joined part of an all-day trip to Osage, Lyon, and Coffey Counties in Kansas. Gulls, Raptors, and Longspurs highlighted a beautiful day. 11/25/2017 – Nineteen people enjoyed the beautiful weather while looking at wintering waterfowl, raptors, sparrows, and year-round residents at Loess Bluffs NWR. A few photos from the day can be found on the hyperlinked eBird list. 11/12/2017 – Thirteen people scanned Smithville and found a couple of winter rarities; a Red-throated Loon and Surf Scoter mixed in with 30 other species. 10/8/2017 – Eight participants enjoyed the gorgeous fall weather and surveyed Smithville Lake; they found 24 species including a juvenile Peregrine Falcon, a Snowy Egret, and many gulls. 10/4/2017 – During the fall Census of Jerry Smith Park, four participants found 27 species consisting of some early fall migrants as well as summer residents. 9/30/2017 – Enjoying a gorgeous fall morning at Baker Wetlands the 17 participants observed 57 species including a Le Conte’s Sparrow south of the Discovery Center. 9/10/2017 – Participants enjoyed the wonderful weather, a couple of gull species, and fishing Osprey at Smithville Lake. 8/25/2017 to 8/27/2017 – A total of 26 different people participated in half-day trips spread over three days around Cheyenne Bottoms WA, Quivira NWR, and central Kansas and found 120+ species. Highlights from the trip included 5 owl species, King Rails, and Black-Bellied Whistling Ducks. 8/12/2017 – An Olive-sided Flycatcher was among the 39 species seen at Prairie Center by 9 people in Olathe, Kansas. 7/7/2017 – Ten people enjoyed the prairie flowers of the flint hills; they saw 30 species at Mt Mitchell and much more along Skyline drive in Wabaunsee County, Kansas. 6/17/2017 – Summer resident species were counted by 7 people at Blue River Parkway in Kansas City, Missouri. They tallied 39 species in the couple hour walk. 6/14/2017 – During the summer census at Jerry Smith Park in Kansas City, Missouri 5 people found 34 species. 6/4/2017 – Twenty-One people enjoyed the prairie habitat around Dunn Ranch in Harrison County, Missouri. 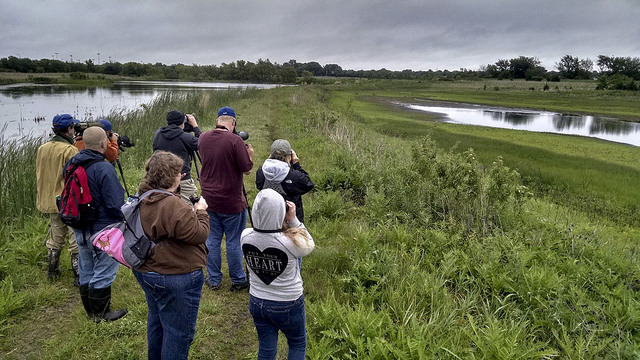 They found a Black-billed Cuckoo, Henslow’s Sparrows, Bobolinks, and others among 54 species. 5/24/17 – 11 individuals had 51 species and great views of a Common Tern at KCP&L Wetlands! 5/17/17 – Rain in the forecast and all around limited participation, but 34 species were still at KCP&L Wetlands. 5/14/17 – After gaining security clearance at Fort Leavenworth, a group of 17 individual survey the diverse habitat and found 68 species! 5/10/17 – Four people found a Blackpoll Warbler and nice shorebird diversity at KCP&L Wetlands. 5/5/17 – A dozen individuals walked the trails at Tomahawk Park and Leawood City Park enjoying nearly 50 different spring migrants and summer residents. 5/4/17 – An Ovenbird highlighted a short early morning walk in search of migrants along Indian Creek Trail. 4/28/17 – A short early morning walk at Tomahawk Park found 43 total species. 4/27/17 – A short early morning walk at Indian Creek Trailway found 38 species. 4/26/17 – Early migrants highlighted 40 species during a walk along Line Creek Trail. 4/26/17 – Shorebirds and early migrants at KCP&L Wetlands were observed by 7 participants. 4/22/17 – Five people stayed out late for Common Poorwill and a surprisingly nice diversity of shorebirds at Cottonwood Falls Water Treatment Pond. 4/19/17 – Shorebirds, sparrows, and waterfowl kicked off weekly Wetland Wednesdays. 3/25/17 – A group of 10 search Linn County and found over 60 species. 3/8/17 – American Woodcocks were on display for a group of 10 at Jerry Smith Park. 2/18/17 – Sixteen individuals search Clinton Lake, Baker Wetlands, and Perry Lake for waterfowl and gulls. 1/29/17 – A long-tailed duck highlighted the search around Wyandotte County Lake for the group. 1/28/17 – The Blue River winter census conducted by 10 individuals found 28 species. 1/25/17 – The Jerry Smith winter census conducted by 10 individuals found 19 species. 1/21/17 through 1/22/17 – A group found a wide variety of waterfowl including Amercian Black Ducks and Mute Swans. 1/1/17 – Kicking off 2017 a handful of individuals search Blue Springs for overwintering birds. A Hermit Thrush posed for a picture even.